never-seen-before terrain in the inner solar system. planning the overall mission. 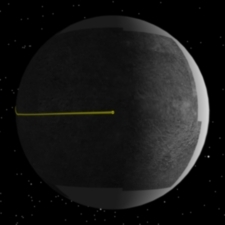 MESSENGER was launched on Aug. 3, 2004.
orbital study of Mercury in March 2011. University Applied Physics Laboratory, Laurel, Md. Observatory at Mt. Hopkins, Ariz.
questions in the study of the solar system. close as 124 miles above Mercury's cratered, rocky surface. 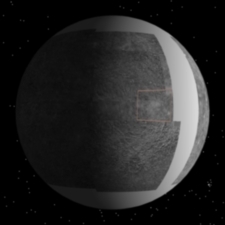 Mercury in the mid-1970s, it surveyed only one hemisphere. gather essential data for mission planning. to get an idea of the composition of the surface." basins in the solar system. basin. During this first flyby, we will image the other side." of the mineralogical and chemical composition of Mercury's surface. tail that sweeps behind Mercury. The first images from MESSENGER have started to arrive. Mercury is still a blurry crescent, but exciting images are ahead Time to keep an eye on this page (the mission's main flyby1 site)If there is going to be any kind of live coverage on NASA TV, like MRO's orbit insertion, maybe it would be a good idea to host a live event on the 14th. There's also a very good article summarizing (but with good detail) the objectives of the mission, this flyby, and a good deal of illustrative images in this Planetary Society article... take a look at that tortuous path to get to Mercury in 2011! Always amazed at the navigation - a flyby of 124 miles after a 4.9-billion mile journey.. now that is accurate after "bouncing" off a few planets.. This is a very good example of where terrestrial analogies for travel fail us as we try to understand how to get to a place like Mercury. Mercury is never terribly far away from Earth (1.0 AU +/- 0.4 AU) but it is about as difficult to get to Mercury as it is to get to Pluto. This is because a spacecraft must shed so much of the 30 km/s-around-the-Sun velocity that they have when they start from Earth. Using gravity assists from Venus make all the difference in shedding orbital energy, and "dropping" into a progressively lower orbit around the Sun to get to Mercury. Furthermore, Mercury's orbit is rather tilted relative to the ecliptic plane, and so further gravity assists are needed to "crank the plane" enough to match velocities with Mercury as much as possible so as to minimize the final propulsive maneuver necessary for orbit capture. It would be very interesting if APL showed the figures for the delta-V that would be needed for orbit capture at each of the Mercury flybys. For this first one, it would be far beyond the capability of the propulsion system, but the next one will be better, and the final one will be just right. REALLY close now... you can see surface features already. Just one day to close approach! We are 3 hours and a half away from closest approach, and this is the last released image, taken at 760000 km from Mercury with a resolution of 20 km/pixel. There is a great timeline of events here, where you can follow what is happening in these crucial moments. MESSENGER should be now wrapping up the image-taking process for the Approach Movie. In an hour and a half comes the WAC color and UV imaging, the first of the fast observations around closest approach. This site concentrates more on launch vehicles, and specially human spaceflight. More engineers than scientists. "If I wanted to lead a bunch of robots that could only follow orders, I would have joined the Army!" We'll probably see something tomorrow, but I don't expect much. Messenger has flown by Venus twice and the Earth once during its three-plus year mission so far, but APL has only posted 10 images and a half-dozen movies on its web site, encompassing all of these flybys, to date. Such hoarding of the type of imaging that the general public would be most interested in is puzzling, especially when NASA science seems in need of a bit of self promotion. Just more proof that when you think you know everything about our own neighborhood, we don't. We have passed the first optical and UV imaging sessions, the NAC approach mosaic and right now we are in the middle of another UV spectroscopic imaging. I forgot to say it before, but there's a nice animation to encompass with the actual events in the timeline here: http://messenger.jhuapl.edu/the_mission/movies/M1_Phase_B_final_text_small.mov where it shows graphically what parts of Mercury they're imaging in each stage. Next event is total eclipse, where closest approach occurs. Following that, once in sunlight again, MESSENGER will perform a laser altimeter observation followed by lots of optical close-by pictures. Far cry from the circus that accompanied each of the flybys of the 70's. Combined lack of interest from the public, and downplaying of anything not VSE/manned exploration. The funds for web communication are tiny, and even thats not present even in a minimal way. Messenger should have passed its nearest approach and have begun to draw away from Mercury now. Now entering the color photographing phase. Lots of close-by pictures taken in 4 intervals. Last wide angle camera observations for now, in the marked area. Now coming up in a Narrow Angle Camera Hi-Res imaging session. Imagery from the fly-by won't be uplinked back to Earth until (at least) 22 hours after the pass is over. Photographs will be released on Wednesday.